Master hand-crafted musical instrument makers, better known as luthiers, perform the magic of transforming select pieces of wood into the most incredible musical instruments known to mankind. World famous Italian luthiers such as Andrea Amati (1520-1611), Guiseppe Guarneri (1579-1630) and of course Antonio Stradivarius (1644-1737) are widely recognized as having produced absolutely amazing instruments of enduring and profound beauty and quality. Through the instruments created by these and many other master luthiers throughout time (about 600 years), as performed by world class instrumentalists, much of the beautiful music we all listen to today is performed on the hand crafted instruments made by them. It would be impossible for me to write an article with the intent of conveying to you the years of internship and the total personal involvement a luthier invests in the instruments they create, especially if the written word were the only tool I could use to send such an all encompassing and profound message. The digital age has brought additional tools which can more easily bring to light the message of instrument making and the investment of the luthier. For those of you who have worked with a master luthier, you know what I am talking about. While perusing YouTube for an appropriate video to use in this article, I ran across a very excellent video series which provides the mechanism by which I can best convey to you the message of the master luthier, however, the videos are not my creation. Our featured documentary film is titled, Story of a Luthier by the Italian film maker, Alberto Bona, the producer and the director of the documentary. A very special thank you goes out to him for his excellent effort in making this film, as it provides deep insights into the world of the master instrument makers. His messages are clear, precise and very well presented in this video. 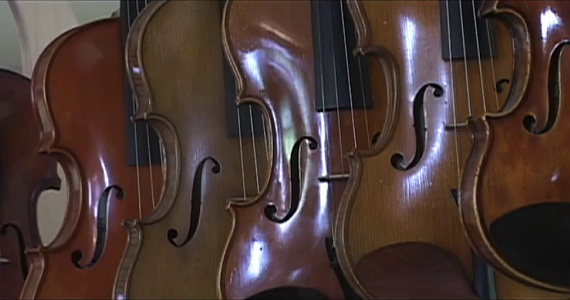 This is a documentary about instrument making, more specifically violin making. Mr. Bona has created this film by following the life of the Italian master luthier Renzo Mandelli. He has not only captured the essence of violin making from several perspectives but he has also provided us with key historical references strategically placed throughout the film. I was surprised to learn that the view count on YouTube was far to low for such a wonderful story and I wanted to do something about that. So it is that I came to write this article not only to help Bona and Mandelli, in the sense of getting this word out, but to provide to you, the performers, who play these wonderful instruments, and to audiences everywhere who get to experience the amazing sounds emanating from them, the opportunity to learn something about what goes into actually hand making these instruments and to help you become more aware of the value luthiers bring to the making of musical instruments in a broader sense. Further, having this message conveyed through film, of a master luthier, is by far more suitable then anything I could have produced on my own, since I am not a film maker or luthier let alone a master luthier speaking from personal experience. However, I am a guitarist, who owns beautifully made guitars, and it is from this perspective that I write this article in total appreciation of what luthiers do. With that said, I owe a huge thank you to both Alberto Bona and Renzo Mandelli, (etal. ), for making this article possible and for their superb messages beautifully expressed in this video documentary. It is their gift and it is for all of us. In this case, the context is generally violin making however, the nature and general philosophies, the artistry, the craftsmanship and the basic character of the luthier demonstrated in the film, to a degree, are character traits which reside in the nature of other luthiers. They, luthiers, are a unique breed of people who are required to have a vast knowledge of such scientific topics as acoustics, mathematics and chemistry as well as high skills in woodworking, layout and design. An incredible degree of patience and attention to the smallest of detail are also a part of the foundations needed in the art of luthiary. Synopsis: Story of a Luthier is a tale of timeless values, of beauty and poetry. We look closely to the life of Renzo Mandelli, a luthier who masters a craft which has survived the restless advent of technology: violin making. We follow him at work, in his studio, finding out the secrets behind the making of violins. The documentary also features interviews with some of Renzo’s clients and other musicians, who guide us through the history of music. A person doesn’t usually think about the amount of knowledge and the high level of skill, in multiple skill sets, which are needed to produce such things as the adhesives or glues, the correct choice of chemicals for making stains, varnishes or other surface treatments and how all of these influence or impact the sounds produced from the instrument. Lastly, knowledge of a wide array of tools is needed as well as making good tool selection for a given task and the proper use of all of these woodworking tools. A master luthier needs to know these things and much, much more. It is from gaining this broader perspective and understanding of the vast knowledge and skills needed to produce world class instruments that we gain a deep respect for what a luthier actually does and that one comes to greatly appreciate their true value as well as the value of the instruments created by them. The video is titled the Story of a Luthier. The primary language used in the film is Italian and it is close captioned in English. You will need to reserve approximately 47 minutes to watch the full film in one setting. With that said and with no further ado, here is this most amazing video. Please note that links on the video player are external links and they will take you to the Culture Unplugged website. …and so…, now you may have gained a broader view of what goes into making musical instruments (out of wood) as well as understanding a little about the heart and soul of those who make them. How is it that I could tell this story even close to what Alberto Bona has presented here, and for that matter the content conveyed from Renzo Mandelli? I couldn’t. It is by and through films such as this that one can come to know more about instrument making, the philosophies adopted by the luthier, the luthiers message, in this case, that message which Alberto and Renzo wish to convey and the personal level of involvement in the instruments built by the true Luthier – the Master Instrument Makers.